Next time you are on the Long Walk, look up inside the archway between Williams Memorial and Jarvis, and be sure to look up! You will see vaults of terracotta tiles arranged in a herringbone pattern, the signature design of Rafael Guastavino’s Tile Arch System. Guastavino tiles were prolific in late 19th and early 20th century American historicist architecture. Guastavino emigrated from Barcelona in 1881 and brought his signature Catalan vaulting technique to the U.S. When he died in 1908, his son Rafael III took over the company. The first major firm to incorporate the Guastavino tiles in the U.S. was, McKim, Mead, and White in the Boston Public Library. One may recognize the tile pattern from the lower level of the Grand Central Terminal and the famous Grand Central Oyster Bar, the Great Hall of Ellis Island, the underside of the Queensboro Bridge, and countless other buildings across the country. In Providence, Central Congregational Church features the first dome that Guastavino constructed in the United States. McKim, Mead, and White also worked significantly on collegiate architecture, including commissions at Connecticut College and Yale University. In Hartford, you can also find Guastavino vaults in the lower levels of both City Hall and the State Library. The November 3, 1914 issue of The Trinity Tripod discusses the opening of the Williams Memorial Library. It was donated by J. Pierpont Morgan in honor of his friend Bishop John Williams, the fourth President of Trinity. Morgan was a trustee of the college for 27 years. It cost $150,000, and J.P. Morgan died before it was completed. Guastavino vaults and domes are studied today because of their unique structural capabilities. They span vast spaces with limited material bracing. They were also known for being fireproof, which was an important aspect in the construction of the Williams Memorial library. I saw some of Guastavino’s early work when I was studying abroad in Barcelona. He was an influence on the famous Catalan modernist architect Antoni Gaudí, both architects used the Catalan vault. 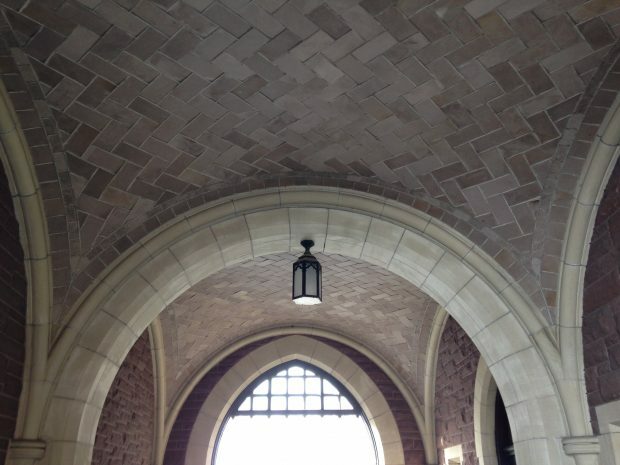 The tile vaults link our Hartford campus architecturally to Trinity’s Barcelona program. Look around and you will see more of Guastavino’s work in hundreds of the most monumental buildings across the country. Take a look at that archway and to see how Trinity is part of the tradition.